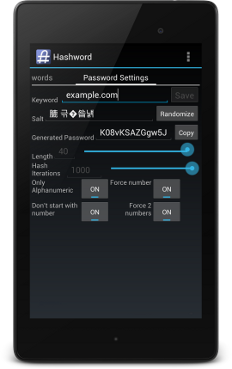 Hashword - a password generation and management app. This program is free for non-commercial use. But donations are a Nice Thing To Do. Because you visit lots of websites that all have their own login. If you want actual security you need a complex, unique password for each one. optional salt value. It does this using the cryptographic hash function SHA-256. You can use the same one for all of your generated passwords. This password is not stored for security reasons. or type something to identify the generated password with. Anytime you copy a URL it will be detected and entered here automatically. 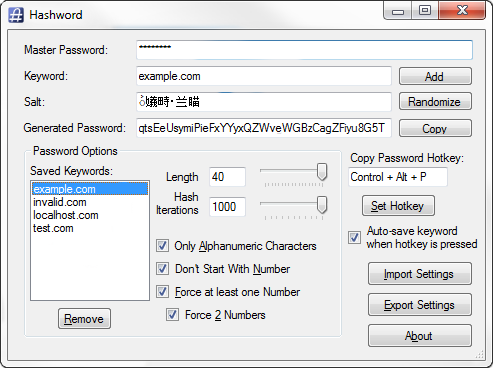 You can use this to generate more secure passwords. You can change the salt to create a new unique password. 4This is your generated password. Copy it and paste where you want to use it. The clipboard will be cleared after a few seconds. 5Make sure to save your keyword. All of the password options and salt are stored, but not the password itself. 6Set the password options here. If the current keyword is saved, the options will be stored with that keyword. If it is an unsaved keyword, you are changing the default options for all new keywords. Any time you press the set key combination the current generated password will be typed as well as copied to the clipboard. The clipboard will be cleared after a few seconds. You have the option of auto saving new keywords when this is done. 8Import/Export your settings to XML. Fixed a problem with forcing numbers in the password.